Figaro - Figaro - Fiiiigaro! Always dapper and impeccably dressed, the tuxedo cat looks like it is perpetually ready to attend the opera. Meet Figaro: Born to a feral mother and rescued off the streets, Figaro was found cold and suffering from pneumonia. 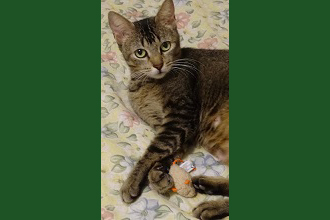 After a little TLC and some necessary medicine, this kitten is back to perfect health and ready to become your new sidekick. Charming, sweet, and oh-so-playful, you will never be bored with Mr. Personality by your side. He loves to make friends with other cats and will go out of his way to greet any children he sees. Did you know that studies suggest that tuxedo cats can be up to 200% smarter than other felines?! They were the cats of choice kept by William Shakespeare, Beethoven, and Sir Isaac Newton. With their uncanny sense of mischief and gentle nature, they were the perfect companions and muses for creativity. Tuxedo kittens often have their eyes open at birth and even though they detest water, they are the best swimmers in the cat family. They are known for being friendly, affectionate, playful, and outgoing, and their laid-back nature makes tuxies less likely to wander than other kittens. Tuxedos particularly love to snuggle up next to anything soft and will climb into your lap and cater to your every whim. As long as you don't miss their mealtime, the tuxedo cat has a bedside manner that cannot be matched. If you are looking to bring a little extra class into your home, this kitten will not disappoint. He is available for immediate adoption or may also be fostered by a family who will consider potential adoption. 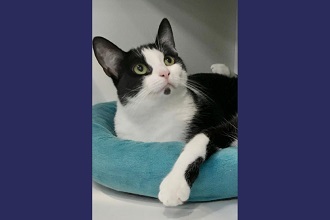 If you would like more information about Figaro, please contact Forgotten Felines at 914-428-7969 or visit www.ForgottenFelinesNy.org. And just one more interesting tidbit. Tuxedo Stan ran for mayor in Halifax, Canada. Although this spirited tuxie didn't win, he did bring awareness to the plight of homeless cats in need.